As we undertake settlement of our two latest residential projects, Royal Elizabeth and Arden Park, the team at PDG are also working to bring several new and very different projects to market. We are working very closely with council to ensure that we meet the community’s expectations and we are confident that a positive decision will be reached on these projects within the coming months. We therefore encourage you to register you details to receive news and information as it comes to hand. The City of Melbourne has now released their recommendation in support of PDG’s proposal for an integrated village style development in West Melbourne. We look forward to achieving a formal approval later this year. This project represents a considered approach to a pivotal inner city site and aims to form a vital link between the North Melbourne Station, its adjoining mixed-use buildings and the neighbourhood’s residential terraces and homes. Our concept, developed in close collaboration with DKO architects meets all criteria in the Better Apartments Draft Design Standards 2016. In line with the PDG Urban model, this development will be underpinned by architecture that is sensitive to the local character of West Melbourne, with a selection of materials that draw from the site’s industrial history, presented in modern form. Significant landscaped open space will be provided for residents in addition to a local community pocket park. A range of 1, 2 and 3 bedroom apartments will soon be available for sale along with several retail tenancies at ground level. Unimpeded views of the city skyline and the bay are likely to be achieved by many of the apartments along the Adderley and Abbotsford Street frontages. A range of 1, 2 and 3 bedroom apartments in addition to 18 double level townhomes within the heritage building will soon be available for sale along with several retail tenancies at ground level. We would like to take this opportunity to share the most up to date artist impressions of the project. Articulated building forms provide a transition between the higher density commercial vision for Drybough Street and the finer grain residential fabric of Adderley Street. 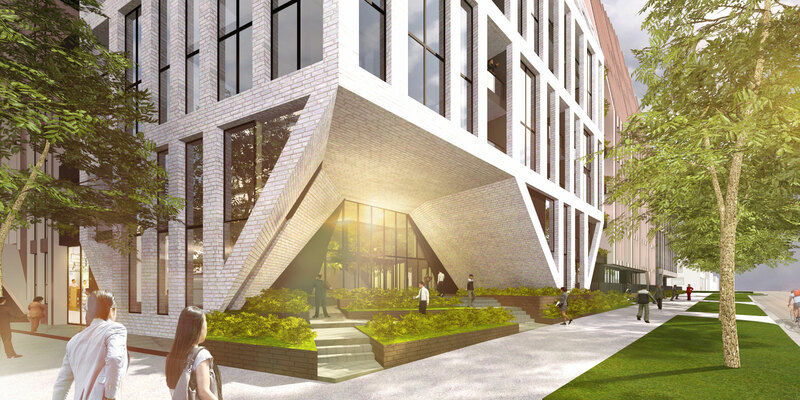 A large corner atrium will provide a sense of arrival for residents, as well as providing pedestrians with visual connectivity to the green landscaped courtyard within. The heritage J.Gadsten building, a former tin and glass factory, will be retained and converted to double height loft townhomes. A public pocket park on Drybough Street with retail will contribute to the village feel being created within the North Melbourne Station precinct. We look forward to providing you with news of an outcome in the near future and at the same time releasing imagery of the proposed building and community hub. This will be a landmark building for PDG and indeed for the city of Melbourne and simply is not to be missed. To receive detailed information as it becomes available, we encourage you to register you details for the project.